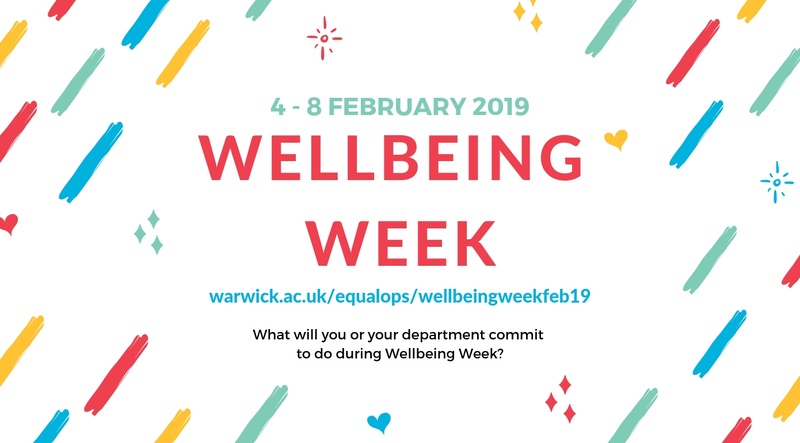 This year, Warwick will be holding a Wellbeing Week to promote the support which is available and communicate key messages on wellbeing, including healthy lifestyles, physical health and activity, mental health, and financial wellbeing. The whole week will be underpinned by a theme of Dignity and Respect and the impact this can have on our wellbeing. A specific day focusing on Dignity and Respect will be on Tuesday 5 February. (This session is open to staff and students). Warwick Secret Challenge is an interdisciplinary brainstorming workshop with elements of design thinking. It was developed and piloted in 2017/18 academic year by a team of Warwick students as an opportunity to challenge oneself, meet other staff and students and learn beyond the boundaries of a degree and department. You can read more about Warwick Secret Challenge here. Register for the Wellbeing Warwick Secret Challenge here. (This session is open to students only). No painting experience neccessary you will be shown what to do on the day. Please wear old clothes and shoes you don’t mind getting paint on. Some old T-Shirts you can put on over your clothes will be provided. Lunch and refreshments provided. You can find more information about Warwick Volunteers Give it a Go! sessions here. Meet outside the Creative Learning Space in Warwick Arts Centre. Join one of the Mead Gallery curators for an hour-long walking introduction to a selection of sculptures, including Barry Flanagan’s Acrobats. Feel free to bring a packed lunch. Find more information and register to attend the Sculpture Trail here. Seven years ago, Friends of Canley Green Spaces and Warwick Volunteers planted 420 trees that have now grown into a woodland. Volunteers will be revisiting the tree planting site in Park Wood, to cut away unwanted vegetation from around the trees. This will improve the appearance of the new woodland, giving the trees more light to ensure that they grow healthy. Tools and gloves are provided. No experience is needed. Please wear suitable outdoor clothing and strong shoes or boots that you don't mind getting a little muddy. Some of the vegetation is prickly, so wear old clothes that fully cover your arms, legs and ankles. The activity will last for about 3.5 hours. Are you a student or staff member at the University of Warwick? Come and learn to knit and crochet with a friendly group in the Chaplaincy. All materials provided. Drop in any time between 1 and 3 on Thursdays in term time. You can find more information about Knot Just Knitting here. Volunteers design and produce craft-making kits, which are donated to University Hospital Coventry and Warwickshire for patients to use during their stay and also design custom made cards to send to seriously ill children through the charity Postpals. Crafting happiness is a great way to de-stress, do something good and have fun whilst making new friends. No previous experience is required, enthusiasm and joy to give back to the community is all we need. No need to sign up beforehand – just come along. You can find more information about Crafting Happiness here. You will be able to make your own sculpting dough to create your own mini sculpture either inspired by one of the new (or old) sculptures found around campus or just straight out of your own imagination. If you make a sculpture on one of the first sessions, you can bring it back the following week to paint it. Make an origami Hare inspired by one of our new Hare sculptures on campus. Create abstract art for your window inspired by the University’s collection of abstract paintings (or something from your own imagination). All students are welcome and refreshments will also be provided on the day. You can find more information about Study Happy Creative Chillout here. The Wellbeing Support Team are holding a ‘Take a Break’ session everyday (Monday to Friday), where staff and students can access advice and information in relation to wellbeing and mental health in an informal setting. Light refreshments (i.e. tea and coffee) will be provided and the session will be attended by representatives from the different teams in the Wellbeing Support Services. (This session is open to Postgraduate Research students only). Register your attendance for the PGR student seminar here. Kate Pearson, our Anglican Chaplain, will explore the evidence of a link between spirituality and wellbeing. We will explore what spirituality is and look at resources that may help us explore our own spirituality. Register to attend for the Spirituality and Wellbeing session here. Each week, members of the Postgraduate Community Engagement Team and Wellbeing Support Services will be in the University's dedicated postgraduate spaces to discuss the best ways to improve your wellbeing while studying. Come and speak to the team, share a wellbeing tip in exchange for tea, coffee and fruit, and read the wellbeing tips left by others to get some inspiration! You can find more information about the PGR Wellbeing Hour on the Library's website here. Take a break and join Study Happy for biscuits and chat! You can find more information about Study Happy Kirby Corner on the Library's website here. (This session is open to Postgraduate students only). There is nothing better than a hot, caffeinated beverage to keep you going through a long day of studying! Join the PG Hub team for a study break, to meet other postgrads, and to share tips on postgrad life. This is also your chance to meet the mentors from the online mentorship community in person and get all of your burning questions answered. You can find more information about PG Tips here. Warwick Sport activities as well as massages from a sports massage therapist. Healthy Lifestyles – information on healthy lifestyles which might include weight reduction, increasing physical activity, reducing alcohol intake and smoking cessation techniques. An expression of interest register will also be in operation for people to sign up for a Health MOT (which will be carried out at a later date if enough interest – this would include discussions around lifestyle, smoking, alcohol consumption and blood tests – this would be carried out by NHS professionals). Financial wellbeing – including Bupa, BHSF, Axa, Union Dental, student funding/finance. Warwick Learning Vouchers – pop along and see what you can use your learning vouchers for. Mindfulness practice is one of the 5 ways to wellbeing recommended by the NHS. Doing regular mindfulness exercises can help manage daily stress and has impact areas of the brain related to memory retrieval, decision making, and outward attention. These free weekly workshops are a great way to try different mindfulness techniques if you are a beginner, and find dedicated space and time for regular practice. No booking necessary, open to all students. If would like to learn more about mindfulness practice, visit: warwick.ac.uk/mindful-library. You can find more information about Study Happy Mindfulness here. (This session is open to Postgraduate Taught students only). Each week, members of the Postgraduate Community Engagement Team and Wellbeing Support Services will be in the University's dedicated postgraduate spaces to discuss the best ways to improve your wellbeing while studying. Come and speak to the team, share a wellbeing tip in exchange for tea, coffee and fruit, and read the wellbeing tips left by others to get some inspiration! You can find more information about the PGT Wellbeing Hour on the Library's website here. Register to attend the presentation and workshop here. Speak to Student Funding during Wellbeing Week and National Student Money Week in the Atrium at the SU. Taster session of the IATL Module Understanding Wellbeing Theory and Practice. Register to attend the Wellbeing and Failure session here. Skills and tips to improve motivation. Find more information and register to attend here. Complete this form to express an interest in receiving an NHS health check provided by Healthy Lifestyles Coventry. This would include blood tests and discussions around lifestyle eg smoking , alcohol consumption, and exercise. Start Monday with gentle invigorating movement leaving you feeling refreshed and ready to tackle the week. This class can help to boost memory, concentration and productivity. Find more activities from Warwick Sport here. The purpose of this workshop is to increase awareness of mental health and promote an inclusive and supportive environment in physical activity and sport. Register to attend the Mental Health in Sport Workshop here. Find more activities from Warwick Sport here. This session is now full, please complete the registration form if you wish to be added to the waiting list. Nutritionist, personal trainer, mental health first aider, and menopause expert Julie Dennis will speak about stress, nutrition, exercise and the menopause. Smart menopause eating and drinking essentials to keep you cool and sharpen up your thinking. The right type of exercise to ease anxiety, burn fat and boost your confidence. A ninja menopause mindset trick that can stop a hot flush or menopausal rage in its track and get you back to sleep at 3am. Julie specialises in practical and natural solutions for controlling menopause symptoms and help busy professional women break through the brain fog of menopause. You can find more information about Julie on her website www.juliedennis.net, and register to attend the menopause talk by completing the form here. These sessions will be led by Warwick Sports' climbing instructors. No climbing experience is necessary. If you are interested in this session please email j dot tanton at warwick dot ac dot uk. Register to attend the CPR & Defibrillator session here. TRiM focuses on developing mindfulness through a mindful approach to running. An accessible way to experience the benefits of physical activity for health and wellbeing. This six-week course costs £20 for University of Warwick students. Wednesday 6 February, 10 - 11.30am, Cryfield Pavillion. Book on the TRiM course here. These sessions are free of charge. Book onto the 10.30am Zumba class here and book onto the 11.30am Zumba class here. Take on your favourite university mascot 'Terry the Bear' in brand new sporting challenges around campus every Wednesday 12 - 2pm. Be in with a chance of winning some great prizes. Find more activities from Warwick Sport here. This course costs £15 for University of Warwick students & staff. Find more information and book your place on First Steps to Fitness here. To find out more and get involved, contact Marcus dot Webber at warwick dot ac dot uk. Build resilience and release stress through a combination of low impact movement, body weight exercises and stretching all in the comfort of your own clothes. Find more activities from Warwick Sport here. (This session is open to staff and students). Find more activities from Warwick Sport here. Departments to promote Dignity and Respect at Warwick - what will your department be doing? We all have times when certain events or the actions of others in the workplace can result in a negative emotion rising up within us. Whilst an initial emotional response can surface in an instant and is difficult to avoid, what follows is something we have more control over. Managing our emotions is an important aspect of emotional intelligence that we could all be developing for ourselves. In doing so we are more likely to respond to others with respect and consideration, whilst also feeling able to effectively handle relationship challenges in the workplace. This one hour interactive workshop will provide you with insights and tools that will equip you to manage your emotions more effectively and to improve your relationships at work. Register to attend the Emotional Intelligence session here. This workshop will explore dignity and respect, and how they are essential to our professional and personal lives. Participants will have a chance to consider why dignity is important, and the consequences of actions that violate human dignity. As such, the workshop may deal with some issues that are particularly troubling, and may cause discomfort. The workshop is designed to provide the opportunity for participants to discuss concerns in a supportive environment. Register to attend the Dignity and Respect session here. If you have any questions or comments let us know on equality at warwick dot ac dot uk.